TV Show Renamer is a free software program for Windows devices that you may use to rename media files, especially TV show episodes and entire seasons. Many TV series releases on the Internet follow a specific naming convention. Filenames usually include the TV show name, episode and season, format and group that released a particular episode or entire season. The information is helpful prior to downloading TV show releases as it helps the user identify the show and quality of the release. Some users who have downloaded TV series rename them on their computer, especially if episodes of a show have been downloaded from multiple sources as this often means different naming schemes. The same may be true for rips that you make on your own or digital videos that you purchase. Renaming the filenames manually might be an option if a handful of TV shows are stored on the computer; it becomes a nuisance if the count passes a few dozen. 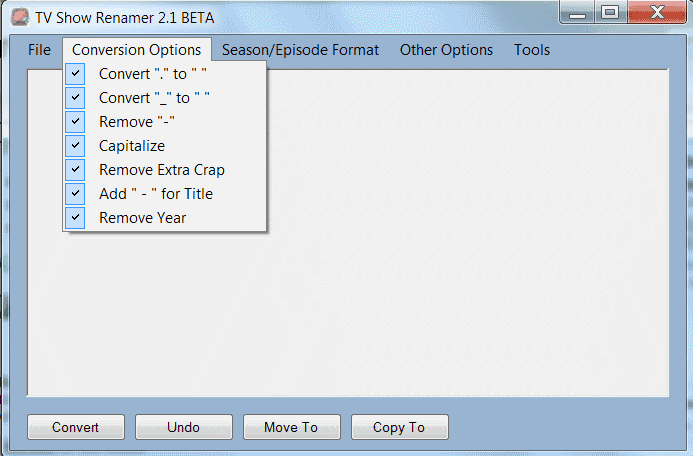 TV Show Renamer is a free program for the Windows operating system that can be used to rename TV shows automatically. It works by adding TV episodes to the program using the file menu to add individual files or files in folders. A handful of conversion options are available of which all are selected in the beginning. Conversion options will for instance replace "." with " ", remove "-", capitalize and remove text that's not part of the TV show's name or season / episode. Conversion options that are not needed can be unselected from the options. It is furthermore possible to specify the season and episode format. The default format is 1x01 which can be changed to 0101, S01E01 or 1-1-2010. A click on the Convert button renames the TV shows that have been added to the program. TV Show Renamer has no preview option. It is however possible to undo changes. Satisfactory results can then be moved or copied to another location on the computer. It may happen that the TV series filenames still contain words that are needed. Additional junk words can be added in the other options category. These words are then removed from the filenames automatically. Another option provided by the program is the ability to add text that the program should always replace with other text. This can be helpful to rename abbreviations like WS to Widescreen for instance. TV Show Renamer provides an interesting option for TV series downloaders to rename their downloaded shows automatically. The program could use a preview function, preferably right in the main interface and automation to perform the renaming automatically. The software is compatible with 32-bit and 64-bit editions of the Windows operating system. Downloads are provided at the Codeplex program website. Update: The program has not been updated in a while. While you can still download the latest version from the Codeplex archive page it is hosted on. Shame no-ones come up with something similar for Mac users yet! Looks great but it seems to require Flash?